Hi Everyone, I am back. No I did not "stealth flounce" as some suggest, just had a very busy travelling schedule. I have a question that has bothered me for a long time. In all the Apollo visual documentation, whether it be the DAC footage, TV footage or the thousands of photos, the moon is shown to have a layer of regolith ie moon dust. Yet when you examine the 5000 or so photos taken on the moon, most rocks, if not virtually all, do not have a layer of regolith. It doesn't matter if it is a two inch rock or 40 foot boulder, there is no layer of regolith. In fact, most rocks are pristine. How can this be? One can't even argue the rocks came later. The bases of these rocks are covered with regolith and there is no displacement around the rock if it "fell" on the regolith. And besides the moon continues to get hit by thousands of meteors and micrometeorites which create more dust all the time. Have you looked at all +/- 9000 images taken while on the Lunar surface? I know I haven't. Regolith deposition is in geological time lines and the recent rock may not have been exposed to deposition. I'll leave a better explanation to the geologist here on the board. The first missions didn't cover much area and perhaps the low sample rate may be too low to make a definitive observation. Look at the whitish rock just right of center and magnify the image, you will see some covering on it. It does appear that the rock sticks up above the surrounding area. But that took about 15 minutes of searching just the A16 library. So it appears that your initial observation is not well founded. Actually I believe approximately 5500 photos were taken on the surface of the moon. (The other photos were taken off the moon). And yes I have looked at them many times. As far as your example goes. I am not quite sure what you are talking about. None of the rocks have a 1 inch layer of regolith. Take a look closely to the center of the picture (right near the stain on the lens). There are larger rocks with flat top surfaces. There is no layer of regolith. the moonscape should look like a regolith snowfall blanketing everything. Why? Where does regolith come from? Or to put it another way, validate your comparison of regolith to snowfall. To me, it leads me to believe these photos have been staged and the absence of regolith on rocks was probably done for esthetics. If, as you suggest, it was faked, why would it be faked for 'aesthetics' rather than to look how you think it should look? Is the more likely explanation not that your expectation of how it should look is at fault? Good, then maybe you can get back to answering the questions put to you about LM stability and plume deflectors back on your earlier thread. I am still awaiting your mathematical demonstration of LM instability using the memo you provided as evidence for your argument. None of the Soviet or Chinese surface images show large accumulations of dust on the surface rocks either. Perhaps your assumptions about where that dust comes from are incorrect. You also need to take into account the origin of the rocks that were photographed. Some are large formations of bedrock, others are large rocks that have moved from one place to another (for example 'Tracy's Rock'). Why would a boulder that has moved or been deposited as a result of a crater forming impact continue to have dust on it? Your premise is based on an oversimplistic assumption about the lunar surface and the processes acting on it. We(you included) are unable to measure the amount of regolith from a two-dimensional image. If you can't see the regolith sloping up onto the rock I described then I have nothing but pity on your eyesight. And no I wouldn't be able to tell anyone how much is there, I'll just tell you it is there on the side of the rock. Yes there are a couple of "flat" top rock, but the picture is neither close enough or sharp enough to observe there is no regolith on top. Lunar regolith does not form like a deposit of snow. No wonder the images look wrong to you because your expectations are incorrect. Lunar regolith is mostly formed by multiple impacts, churned over and over. Some rocks will always be sticking out of the top. And the corollary of that is that a lot of lunar bedrock is not sticking out of the top. By definition photographs of the lunar surface are showing regolith sitting on top of rocks. Hahaha. You think the moon never changes and thus should have an accumulated blanket of dust. Too funny. What do you think happens on the lunar surface when an impact occurs? What happens to any dust at the impact site? What gets exposed by the impact? Indeed, all the rocks sampled are of regolith. Lunar regolith contains rock fragments from the size of houses down to silt sized grains. 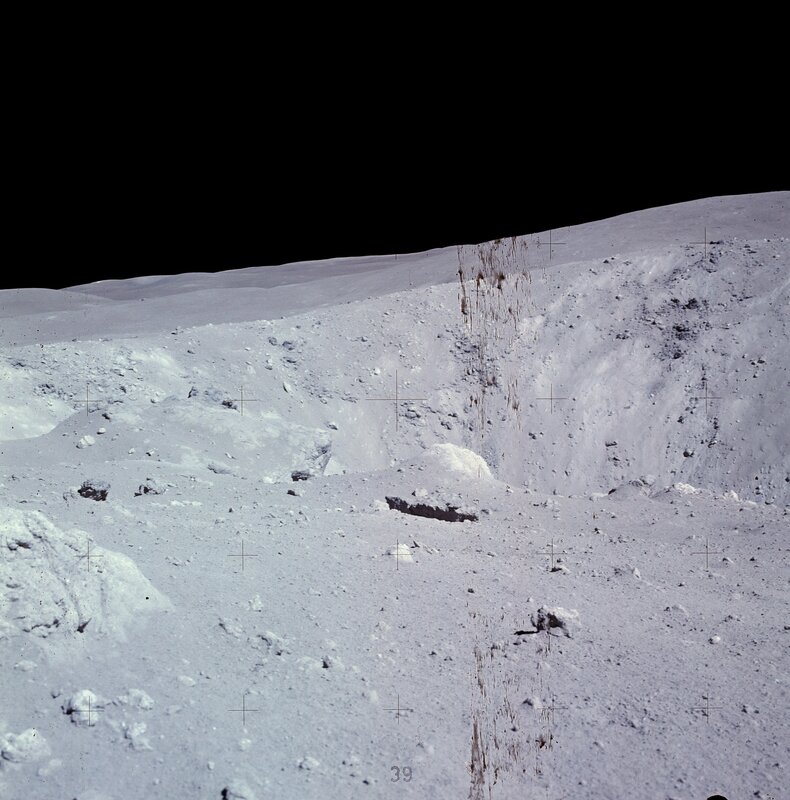 The only bedrock images during Apollo was some in situ material on the far side of Hadley Rill. House Rock from A16 springs to mind. And with all due respect, Abaddon comments that impacts will create these “clean” rocks is somewhat nonsensical. If the impact removes the Regolith off a rock 2 inches above the ground why doesn’t it remove the fine layer of Regolith at the base of the rock 2 inches below? Even if the rock lands there because of a meteor impact, there would be a dispersement of Regolith around the rock. Yet what we see in all these photos are Regolith free rocks and boulders but the bases of these rocks and boulders are buried in a Regolith layer. How can this be? Thanks. Instead of going on about how something doesn't look right and therefore you believe the photos were staged, how about you take the time and give us a plausible explanation of how the house rock video that clearly shows the astronauts in a vacuum and 1/6th G moving towards a rock that is much larger then they expected could have been filmed on Earth.